Established by Alan Brown in 2002, Alan Brown Builders Ltd has enjoyed consistent growth & expansion. In an environment where for many companies growth has often compromised quality and service, Alan Brown Builders' success has been built on promoting those aspects of a company which establish and maintain high standards - and, ultimately, good reputations. General Building Services such as houses and flats as well as house extensions. Development working in partnership with H&A Developers Ltd. and AB Property Developers Ltd.
Commercial - we undertake projects for any commercial organisation, including local schools (for example the provision of classroom extensions), community colleges, sports clubs, churches and many more. Groundworking Contractors including foundation work, drainage and general external works such as paving. We offer design and build services for private clients, and whilst this is mainly for residential projects we are also able to provide the same high quality services for commercial clients. We are an accredited member of the Contractors Health and Safety Assessment Scheme (CHAS). This government non-profit scheme is established as the market leader for health and safety pre-qualification in the UK, and is intended for organisations that are looking for suitably competent suppliers. In addition, all our personnel have the Construction Skills Safety Certificate and all undergo regular training to ensure that their skills are kept up to date. 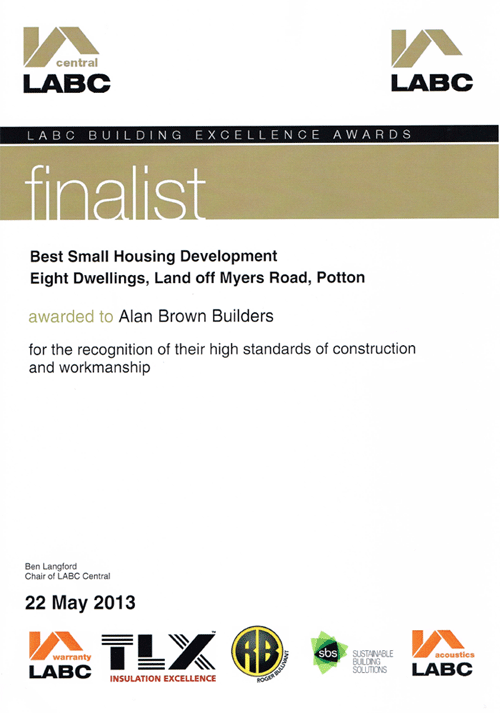 In May, 2013 Alan Brown Builders Ltd. was recognised as a finalist in the LABC Building Excellence Awards. 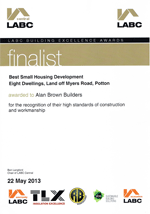 This award recognises the high standards of construction and workmanship that we adhere to at all times.